Note to reader: Please excuse my hair and the bags under my eyes in any following pictures. Thank you. Ever since KO Catering & Pies popped on the Twitter scene, my co-worker and fellow foodie, Lara and I have been licking our chops! A traditional meat pie shop that will also be launching a food truck! It sounded to good to be true! Not only that, by they were actually doing an amazing job on Twitter too! Lara beat me to the punch with a brunch trip with her hubs to scout the place out. Not only is Lara my partner in all things food related, but she is a great blogger & tweeter too, so don’t forget to check her out! Back to the pies! A little history. Being born in S Africa, and raised by S African parents, meat pies and sausage rolls were a HUGE part of my culinary childhood. There was a tiny shack on Alternate 19 in Tarpon Springs, FL. that we would drive out to almost every weekend to stock up on them. The day that shack shut down was a sad day indeed. Since that time, meat pies and sausage rolls have been few and far between, and when you do find them, they are usually frozen. Flash forward 20 years, I am in Boston, and KO Catering & Pies has arrived! We headed down the South Boston for lunch, and were not disappointed! When we arrived, we introduced ourselves to the owners, Kara & Sam, who have been fabulous on Twitter and in emails. We chatted with Kara about the business, and you can instantly tell that this lady has a serious passion for all things Australia & Meat Pie! And she is a foodie! The care in which she talked about how they create their recipes was refreshing. It was also nice to hear how they are moving slowly to make sure they do everything just right! On to the ordering! We ordered and original meat pie and a chicken schnitzel burger, a Lamington and a slice of banana bread. I also took 2 sausage rolls home for dinner. When the pie arrived, I asked for forks, and in no uncertain terms was told that you ALWAYS eat a meat pie with your hands. Everything tasted as good as it looked! Freshly cooked, crispy, flaky, buttery, delicious. And then there was dessert. Who even knew a meat pie shop would have dessert, and GREAT dessert at that! We had a slice of fresh-baked chocolate banana bread and a Lamington, which is a chocolate soaked, coconut covered yellow cake of some sort. Who cares what it is, it is yummy! The shop is small, mainly for take-out, with an 8 seater farm table to the side and 2 window bar seats. It is quaint, and you feel like you are eating at an old family friend’s table. For weeks now, many of you have been reading or following Boston Brunchers. KO Catering and Pies is teaming up with the Boston Brunchers to invite 7 lucky Brunchers to experience “Brekky” at the shop! Who: The 7 lucky food bloggers who wiin this contest! It’s that easy! Now here are the rules: Entries must be posted by Friday, November 19th at 10pm. 7 winners (once eligibility is verified) will be awarded with ONE invitation to attend the private bloggers’ brunch at KO Catering & Pies. The invitation is only good for the winner. No additional guests may attend. The winners will be chosen by KO Catering & Pies and will be judged according to the creativity of your blog comment based on the judges preference. Only one entry per blogger will be eligible for judging. In the instance that you are unable to attend the event, please notify Eat.Live.Blog and your invitation will be forfeited and given to a runner-up entry. This entry was posted in Reviews and tagged australia, australian food, boston, Boston Brunchers, Brunch, Contest, food truck, KO Catering Pies, lunch, meat pies, restaurant, review, rosti, sausage rolls, south boston, take out, vegimite by reneeh. Bookmark the permalink. I had one of the meat pies last weekend at the Fall Wine Fest and I was blown away. Meat pies are fabulous and I can’t wait to try KO’s sausage roll as well! Australia has been at the top of my travel wishlist for ages. (First of all, I have a strange obsession with koalas, and I’m well-versed in the folklore of the dreaded drop bear!) It seems like such a beautiful destination, and every Austalian I’ve met has such a wonderful sense of humor. As for the other requirements, I’m @blumie and I’m following @kocatering_pies and @bostonbrunchers. I live in Somerville. This sounds fantastic! I have been ogling the KO Catering Pies tweets for awhile and frankly I had one meat pie on my grand adventure to London, and while it was passable I would love to have one that is better – Waterloo station is just not as good as it can be I think. Also what else is better than Kangaroos? Seriously, they’re awesome with their jumping. I’m yes on all those things. I haven’t been to Australia but have studied their winemaking, wine regions and wines. I’d be thinking about how the meat pie selections would work with the wines from the home turf. I have already tried two and have some ideas. Meat pies on the other hand are something that I do know a little about. My favorite style is the Jamaican beef pattie and I have made these at home many times. I can’t find good ones that often in New England. Empanadas definitely get high marks and Pork Pie made by our friendly French-Canadian neighbors show up around the holidays for me quite a bit. Pork buns come in many flavors and I am working on them all little by little. Samosas from India don’t tend to have meat in them, but they can, and I offer this as the vegetarian entry. I love them but haven’t been able to recreate them well yet. We have several Indian friends that always seem to know where to get the best ones. And then back to KO. We tried two of their selections at the recent Wine Riot in Boston and enjoyed both of them. Meat or veggie doesn’t matter when you wrap it in a tasty crust. A juicy Zin would go well with the traditional meat pie and a fruity Chenin Blanc would make a nice match with the curried vegetable pie. It was great meeting you yesterday Renee! Thanks again for organizing the event. I’d love to try out KO meat pies! I’ve never been to Australia but one of my best friends just moved there and I’m planning on visiting him next year. I also grew up with met pies (from the Philippines) or empanadas. I’d love to try a new version! So here’s the deal. I don’t really have a connection to meat pies or Australia… but I do have a connection to Southie (East Side, Baby!) and I have been DYING to try this place out ever since I heard about it. Also, Australian men (and their accents) are hot! G’day Mates! My blog needs a picture of me stuffing my face with an Australian meat pie similar to the adorable shot of you, Renee. Never had a meat pie, never been to Australia, but would love more than anything to experience both! Meat pies have such a great history in food around the world. I have sampled Jamaican meat pies, meat knishes from ‘da Bronx, Empanadas Colombianas, I have made Cornish Pasties for my family and medieval meat pies for a feast BUT I have never tasted an Austrailian Meat Treat. Please help me fill this gaping hole in my meat pie education! Meat pies are pretty awesome – I need to eat them more! My two favorites are Shepards Pie and Chicken pot pie. But I would love to try what KO has to offer – Australian pies are a whole new experience for me. I’m not entering the contest, just providing some tempting eyecandy 🙂 Best of luck to the winning bloggers! Thanks Christine! We always like a little extra eye candy! So glad you found a place that reminds you of your heritage!! Looks fabulous! They are so good! If you ever get up this way I would definitely say it is one of the places worth visiting! 1. i have friends in australia and i think they are pretty cool. 3. the person who decided to put pie and meat together as one is a god in my eyes. I am dying to go to Australia. I feel like I’ll have to take a whole month of off to see everything I want to see. I am super curious about these meat pies. I’ve never had one, but they sound scrumptious! Can’t wait to get over there to try some Australian grub! 3. I currently have no history with the meat pie and I think that’s a problem. Doesn’t everyone need a good meat pie story to tell? 5. I think the fact that you are the first “Australian inspired food business in New England” is so beyond cool as is your mascot, a boxing kawala. 6. Although I would LOVE to go to Australia, I sadly don’t see that in my immediate future…this is next best thing, right? A little taste of it right in my own backyard! 7. Meat in pie form or sausage in roll form sounds magical. Absolutely magical. umm… pies… meat? Are you serious? Match made in heaven. My meat-pie experience has all to do with the French-Canadian Tourtiere. I first experienced it in the middle of central British Columbia while visiting the big, old rambling Queen Anne Victorian home my father-in-law owns there. My sister-in-law painstakingly had been rolling out pie dough at home and came to the house with several of the handmade tourtiere’s. They’re an amazing mixture of ground beef, pork, sometimes veal seasoned with cinnamon, cloves, savory and so much more. The combination of savory with the touch of sweet is just addictive. I begged for the recipe over and over again until she finally honored me with the family recipe. I now make it to enjoy with my husband all winter long. It’s traditionally served on Christmas to warm you up after Midnight Mass. I have no experience with Australian meat pies to be honest, but I’m always game to try new things, and you can’t go wrong with any variety of meat pie! I’ve been OBSESSED with all things Aussie after hearing the stories from my former roommate who moved to Sydney (she’s been there for 6 months now). Reading her emails about the Tim Tams, the popularity of beets, and the meat pies has left me drooling at my computer and also made realized the amazing culinary scene down under that I must explore. I’ve actually planned a trip to Aussie (Sydney) for next year to visit her, but it’s a year too far — being an impatient Nelly, I want to try some Aussie cuisine ASAP (as in on Dec 11th :)! I tried making a meat pie from a recipe I found online and it was a DISASTER (probably since my cooking skills also need work). I am dying to taste what a real (good) pie tastes like! I’ve always wanted to visit Australia but never had the chance – I imagine a visit to KO is much easier than that flight. I first discovered meat pies on a trip to England in high school. At the time, I was pretty horrified by them, because I thought pies should only be sweet. Thank goodness my thoughts on this matter have since changed. I’m now at the conclusion that anything wrapped in dough is automatically tastier. Okay, yes to all of the above. Australia is on my top ten countries to visit list! I’m a vegetarian so am looking forward to trying the curried veg pie along with all the chick pea salad and sticky date pudding at KO. I’ve long been a fan of Australia and often longed to go there as I do write a lot about travel on my blog. I have never, however, had a traditional Ausiie Brekky. I DO have avid readers in Australia and think it would really be a kick for them to see this Aussie success story right here in Boston! Pingback: East Coast Grill Brunch « Eat.Live.Blog. Thank you for sharing your Australian story – your blog comments were great! Shame we don’t have enough space for everyone who entered. 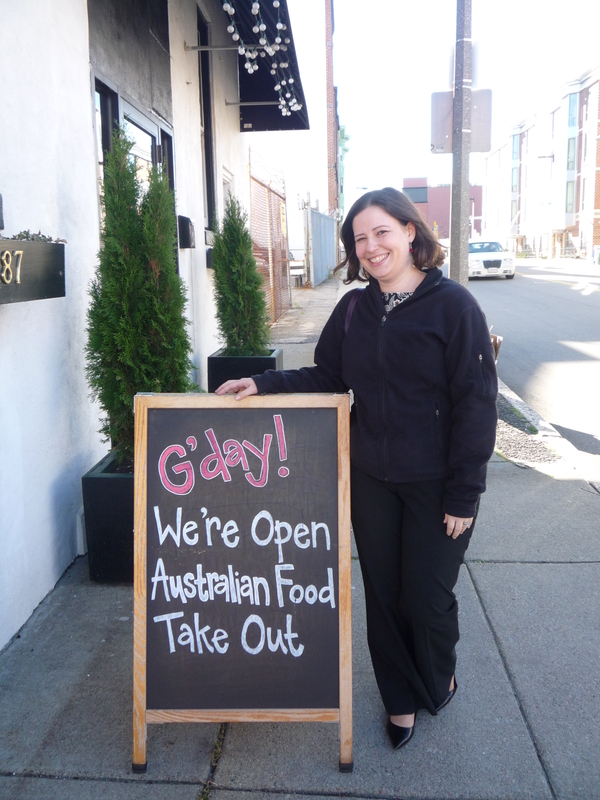 We hope you will have the chance to come to The Shop, say g’day, and enjoy some Australian food soon.